Back in January, TNT announced that the iconic horror TV series Tales From the Crypt will be rebooted as part of the network's new horror block curated by M. Night Shyamalan. Back in April, the network revealed that the show isn't expected to debut until late 2017. But earlier this week, rumors surfaced that this new project may be in trouble, if not completely dead. Shortly after that report, a TNT representative confirmed that the project is still happening, while explaining why there hasn't been much progress thus far. Bloody-Disgusting filed the original report earlier this week, with sources claiming that Tales From the Crypt, along with the other shows in this horror block such as Time of Death and Creatures, have ceased development due to budget issues. TNT issued a statement to the site, clarifying that the network is still trying to solve rights issues for this highly-anticipated project. Here's what the network representative had to say below. "The underlying rights to this classic, vintage property are complicated. TNT and others have been pursuing a solution for more than a year, with significant progress being made. We look forward to the potential for further active development of this valuable franchise once the clearance process is fully resolved." 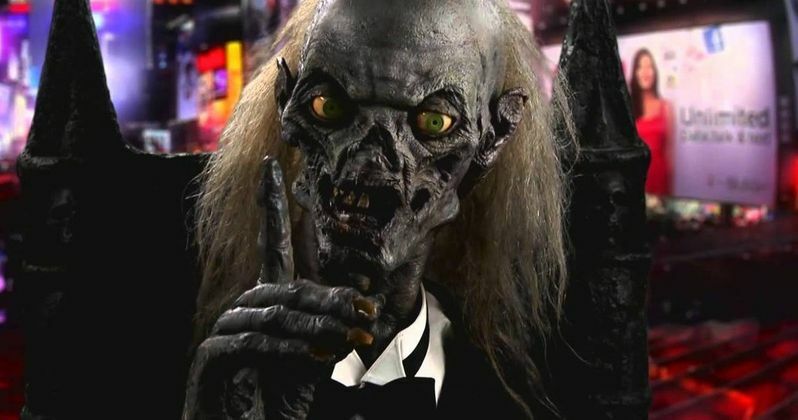 Shortly after news of this show first surfaced, other reports claimed that this reboot would not feature the classic Crypt Keeper, but M. Night Shyamalan later clarified on Twitter that the show would feature a new version of this character. Another report claimed that this new Crypt Keeper would be an "old man in a hood, holding a cane." This character will be seated by a fireplace as he tells these new stories, with this character staying more true to the original EC Comics. The HBO Crypt Keeper, who was voiced by John Kassir, was created specifically for that series. TNT also announced in June that the network will team up with WattPad to find fan-generated stories for this new season of Tales From the Crypt. Writers will be invited to bring their story ideas forward through contests and other opportunities that will be announced on the official Turner profile on Wattpad. TNT issued a 10-episode order for Tales from the Crypt earlier this year, although no cast members have been announced at this time. TNT president Kevin Reilly revealed in August that the horror block will feature "a half-hour anthology and then a one-hour original show with some shorts in between". TNT's new horror block marks the latest incarnation of Tales from the Crypt, which originated as a 1950's EC Comics series created by William Gaines. In addition to Shyamalan and Ashwin Rajan, James D. Stern (Looper, Freeheld) is executive-producing Tales from the Crypt with his company Endgame Entertainment. Aloris Entertainment's John Santilli (The English Teacher, Missing William) and Dan McKinnon (Missing William) will also executive-produce. The original comics spawned multiple seasons of the cult classic show for HBO and became a worldwide brand. Hopefully we'll have more on the Tales From the Crypt series very soon.